This new research study, funded by Canadian Heritage, explores engagement with printed community newspapers in Canada as well as the key role they play in the automotive path-to-purchase. 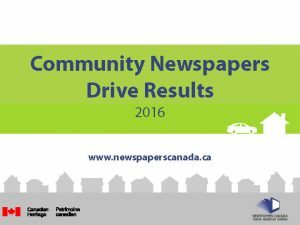 The printed community newspaper is by far the favourite source of local news and information in communities large and small across Canada. Time spent with a community newspaper is virtually unchanged compared to two years ago and not surprisingly, the predominant reason for reading printed community newspapers is local information, including news, editorial, sports, entertainment and events. Printed newspapers are a key driver in the automotive decision making process. Seven out of ten community newspaper readers report that they read or look at the automotive ads that appear in their printed paper. When it comes to purchasing attitudes, newspapers were found to be most useful for general information, price comparisons and deciding which make of vehicle. In all stages of the path-to-purchase newspapers and their sites were found to be most influential. Download study materials below by clicking on the appropriate links. For more information contact Kelly Levson, Director of Marketing and Research, at klevson@newsmediacanada.ca.